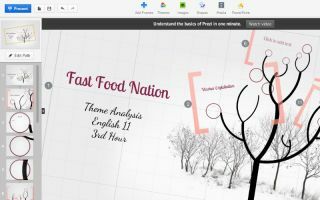 Pros: Attractive, easy-to-use, built-in templates produce professional looking presentations; free upgraded account for teachers. Cons: No easy import for audio files, and, without solid content, the animation can seem gimmicky or distracting. Bottom Line: An elegant, flexible alternative to other online slide software tools, but it requires some finesse to make the effective use of the features and infinite canvas.